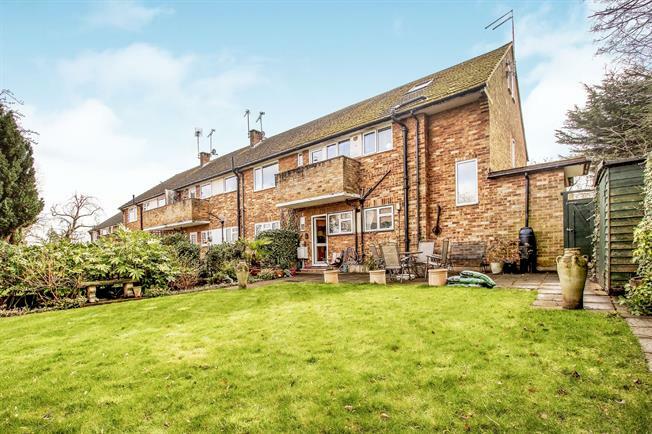 2 Bedroom Maisonette For Sale in West Byfleet for Guide Price £325,000. Central for West Byfleet a purpose-built ground floor two bedroom maisonette within a small cul-de-sac including garage. Having been home to the current owner for in excess of twenty years this appealing maisonette is located at the very end of the road offering a secluded setting with a garden outlook. The property throughout is double glazed and comes with gas central heating and from the kitchen breakfast room, direct access out onto the patio/garden. Outside the garden is mostly lawn set within a fully fenced 40ft x 40ft perimeter with plant and shrub borders including a side gate providing access back through to the front. The property is being sold with a 99 year lease and has a ground rent of circa 100 per annum including a service charge circa 300 which also includes the buildings insurance. To the end of the road there is the West Byfleet recreational grounds whilst turning back into Madeira Road, West Byfleet with local shops and amenities is just two hundred metres where there is also the mainline train station station, providing direct line services into London Waterloo circa thirty minutes. To fully appreciate this property's position and convenience, viewings are highly recommended by Gascoigne-Pees estate agents.